Having played with the first model in the Asus Transformer series, I was eager to get my hands on the latest model to see how it performed. This particular machine was purchased from PC World, who seemed to be the only UK stockist at the time of purchase. I must mention here that regardless of PC World’s somewhat lacklustre reputation at times, reserving online was simple and I just turned up and collected it easily with no fuss. I’m not quite sure that it knows what it is itself! The transformer is a tablet similar to the Apple iPad, Blackberry PlayBook or Kindle Fire… but it comes with a keyboard dock that ‘transforms’ it into a notebook – and boosts the battery life as a bonus extra! The housing is plastic – but it doesn’t feel cheap. It’s well built and feels solid. The slight pattern on the back helps give some grip when holding it. Without the dock it’s very hard not to draw comparisons with the iPad. However, these are comparisons that go favourably for the Transformer. No apparent slow-downs no matter what apps and videos I threw at it, and even when a misbehaving app was encountered (Chrome Beta for those who need to know!) it quickly let me know and let me shut it down rather than having to sit and wait. Most impressive was when I tested SplashTop HD. This remote desktop software works really well. Surprisingly, I was able to play desktop games like Portal 2, Mass Effect and MineCraft in full screen, remotely, with no lag over the inhouse wireless network. For those iPad users out there daunted by Android, don’t worry. Android 4.0 is just as intuitive and easy to use as iOS, but not quite as restrictive with regards to what you can run on it. Therefore, emulators (anyone for some classic C64 games? ), Flash and lots more can all be found here! The keyboard connects via a 40 pin connector & two hooks and feels incredibly secure. It’s clear that attention has been paid to the docking mechanism. My only gripes are that it’s tricky to detach the keyboard whilst closed, and as most of the weight is in the pad itself, the centre of balance is way off. This makes it want to tip back, especially when you’re trying to use it in your lap. Best of all the keyboard has an integral battery giving an extra 5 hours battery life. With a basic 10 hours for the tablet alone, this gives Transformer probably the longest battery life available in a tablet, erm, netbook, erm whatever it is! Tablets fit into a niche for people who want to remain connected and manage emails, browse the net a little, plan their calendars and the like but don’t want to lug a laptop around. The Transformer fills the same niche – but with the option to be just that little bit more. If you’re the kind of person who has or would buy a Bluetooth keyboard for your pad then this is for you. Price wise – the Transformer is comparable to an basic iPad 3, but with better battery life, more storage capacity and a keyboard – but at the expense of the amazing retina screen. That said, the Transformer’s display is higher resolution than that of the iPad 2. Performance: It does everything you throw at it. Price: At £399 you get a lot of tech for your money. 15 hour battery life: This is really not to be sniffed at. Even on the performance setting I was getting 12 hours of use between charges. 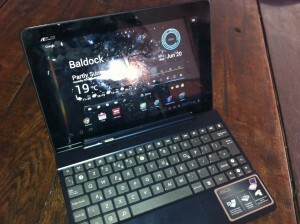 OS: Asus haven’t messed about with Android, this Ice Cream Sandwich is definitely vanilla flavoured. The bundled apps can be uninstalled if you want to, which means you don’t get the usual suppliers bloatware. Weight: With the keyboard attached its nearly twice the weight of a typical tablet alone – weighing in at nearly 1.2kg – and with the weight mostly at the rear it does tend to tip back in use if you’re not careful. 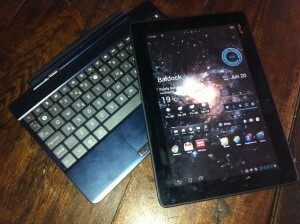 Just the pad alone however is comparable to other 10.1″ tablets. Browser: As mentioned before, the only lack of fluidity becomes apparent when browsing. Screen redraws, whilst brief, can be seen. Hopefully future updates to Android will nail this quirk. Screen: The screen is ‘only’ IPS not IPS+ – so in bright sunlight you may have to pump up the brightness – but with those extra 5 hours of battery life – this isn’t too much of a problem. Currently here in the UK you can only get the Transformer from PC World/Dixons/Currys (why, essentially, the same shop goes by 3 different names is still a mystery to me!). It’s powerful, good value for money and versatile. I’d recommend this wholeheartedly to anyone looking to fill that portable tech niche. 9/10.